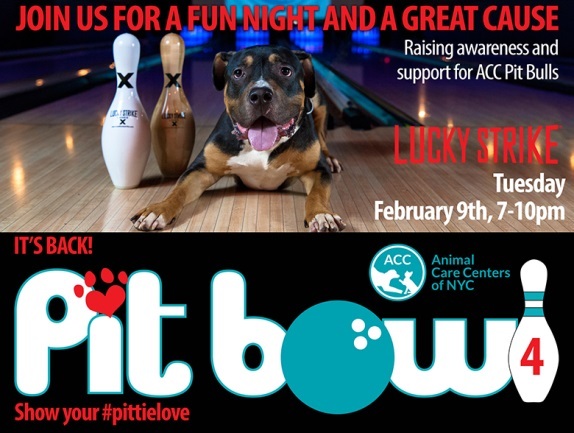 Animal Care Centers of NYC’s Pit Bowl — this is the fourth--supports the organization’s efforts to find loving homes for pit bulls and pit mixes — will be held from 7 to 10 p.m. Tue., Feb. 9 at the Luxe Lounge at Lucky Strike, W. 42nd Street and 12th Avenue, Manhattan. Animal lovers can dust off their bowling shoes and get their friends together for a night of bowling, food, music, raffle prizes, pool, Ping-Pong and mingling with love-a-bull pups. ACC takes in more than 30,000 animals each year, including thousands of pit bulls and pit mixes. 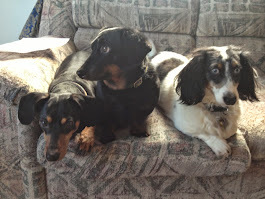 These dogs can be great pets, and this event will raise awareness as well as funds. 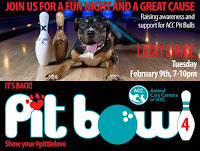 All proceeds from Pit Bowl support the animals in ACC’s care. Individual bowling tickets ($40), full lanes ($400 for 10 bowlers), non-bowling “cheerleader” tickets ($35), and VIP and sponsorship packages are available for purchase online at http://accn.convio.net/site/PageNavigator/PitBowl4.html.